South Korean President Moon Jae-in and his wife have been pictured cuddling a litter of puppies whelped by one of the dogs given to them by North Korean leader Kim Jong Un as a symbol of the strengthening ties between the two countries. 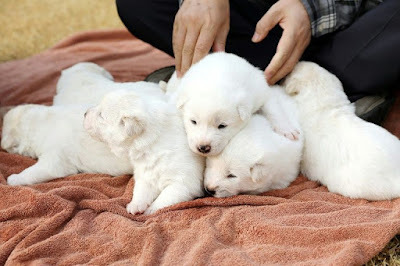 Images released on Sunday show the couple smiling as they sit on the ground outside their residence in Seoul surrounded by the six pups and their mother Gomi. Kim sent Moon a pair of indigenous North Korean hunting dogs following their meeting in Pyongyang in September as a token of their rapidly blossoming friendship. "Meet the newborn puppies of Gomi, one of the Pungsan dogs from North Korea," Moon's office tweeted on Sunday. It posted two pictures of the dogs, one of them showing five furry white pups cuddled on Moon's lap with the sixth in the first lady's arms, with Gomi by their side in the courtyard of the presidential residence. Both the mother and the puppies -- three males and three females born on November 9 -- were "very healthy", the presidential office said. Known for loyalty and intelligence, the Pungsan breed -- a hunting dog with a thick, creamy white coat, pointy ears and hazel eyes -- is originally from an area of the same name in the North.